Religion | The Pagan & the Pen ~ An Online Magazine! Welcome to the March, and my final, article for ‘The Pagan and the Pen’. The topic this month is the ‘Web of Wyrd’, rather fitting I think. You will see what I mean as we go on. Today, I’ve asked Austin “Auz” Lawrence to give his comments on what the ‘Web of Wyrd’ is, but first, a little about Auz. In Heathenry, concepts of fate and predestination are complex and varied. In the modern context, as probably in the ancient world, there are many different opinions on the subject and much misunderstanding. Edain has invited me to provide you with a few words introducing to you how I view the concept of wyrd. The single concept of wyrd was the main focus of most writing in the Anglo-Saxon regarding fate, likely because it was appropriated and re-defined to more closely match Christian theology after the conversion of the Anglo-Saxons. Wyrd is also the most basic concept of fate that is elaborated in Scandinavian belief through a more mythologically complex understanding of fate. In modern English, concepts of fate and predestination are terms with roots in the Romance languages, often now infected with Christian theology. In Romance languages past tenses are conjugated as compounds, while future tenses are single word conjugations. In Germanic languages, the past tense is a single word conjugation, while the future is a compound conjugation. Bauschatz observes that this distinction embodies a fundamental difference in how fate is viewed in the two worldviews. In essence, the Germanic worldview weights ‘fixed reality’ to the past, while Romance language cultures weight ‘fixed reality’ to the future. The way I see it, everything that I am physically (human evolution, the genetic happenstance of my family tree) and mentally (ideas learned through culture, education, being socialized in a family, psychological reactions to life events) is the result of the past. Although a product of the past that is more than me, I am still a unique being with my own free will. This free will, however, is constrained by all that I am and all that I encounter in my life. All of which is the product of the past. But, part of ørlǫg is our unique decisions. As we act, so the Norns do weave. I personally experience the Heathen view of fate in this way: We live in an eternal present that is the sum of all past action. The past very clearly and definitely exists and cannot be changed, as it is the basis for all reality, what our consciousness views as “right now.” The past cannot be changed. The future, however, is not fixed. (Nor, does it actually ever arrive since it is always “today.”) But, the future is predetermined in a manner. The future is constrained by what has occurred in the past, since action in the past is constrained by that “which is,” the wyrd that gives form to all present reality and options. Due to wyrd things are bound to happen. There are deeper mysteries and philosophical implications to the Heathen view of fate than anything I have presented here. It is all rather wyrd and confusing, but life is like that! What Heathens tend to focus on is trying to embody what they believe is good character in their action, the virtues, since this is what our tradition teaches is the best way to meet the debt that past action has determined is owed. At the least, as strophe 23 in the Hávamál reminds us, there is no use staying awake at night worrying about the past. It is better not to worry, get some sleep, and in the morning meet the day as the best person you can be and do something about whatever might be troubling you. Mitchell and Robinson. A Guide to Old English. Simek. Dictionary of Northern Mythology. Zoëga. A Concise Dictionary of Old Icelandic. A huge thank you to my special guest, Auz, for taking the time to share his thoughts. His description and interpretation of the Web of Wyrd is excellent, in my opinion. 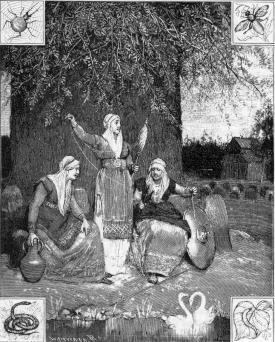 I wish you all peaceful and safe travels along your strands of the Web and hope the Norns give you a wonderful and interesting life. One of my patron deities is Hermes so the idea of not doing something when I travel, no matter how small, is unthinkable. At bare minimum a prayer to him before boarding a plane for smooth, uneventful travel is a must. Sometimes I’ll find money right before a big trip and will honor him with an offering later. The morning of my last trip, I found a $20 bill on the ground. Given I was seriously broke and traveling on the company’s funds, it was a blessing and then some! Some people I know have travel altars, others find small ways to make their days meaningful. If you already have an established morning meditation or prayer routine that requires minimal preparation and ritual, keeping it going while on the go is easy. For people performing something more intense for a duration of time such as the Abramelin, I would imagine this would be far more challenging! When you travel, do you have any special rituals, offerings, or habits you have as a modern pagan? You certainly don’t have to be a devotee of Hermes to appreciate what it means not just to be a pagan on the go, but maintaining whatever practices you have while away from home. How about you? I’d love to hear from you. Chime in on how you honor the gods while away from home, especially if it’s for a vacation you rarely get to take. Back in my college days, I squeezed in a module on religious studies. Bits of it I can still remember. One of the points we discussed was why people get involved with religions, and one of the answers the tutor offered was the desire to be part of something. All religions, so far as I know, have badges of belonging. Signs and symbols identify believers to each other, and may flag them up to others as different. Religious garb both marks folk as part of a group, and highlights them as separate from all others. Paganism has its symbols too, although many of them are also popular with New Agers. You can’t mistake the velvets, silver and pentograms of a female witch. Druids have the Awen symbol /l\ Norse folk wear Thor’s hammer, and so forth. Fifteen odd years ago when it didn’t feel entirely safe to be out, we’d sound each other out by dropping ’blessed be’ into the conversation, amongst other things. Back in my college days, when I was first coming out as pagan, there was a huge thrill to finding fellow travellers. It didn’t matter who they were or what they believed, but they shared something magical with me – a secret, dangerous sort of truth. Being pagan was exciting. Belonging to something hidden (which is what occult literally means, after all) had an allure to it. Coming out to non-pagans felt like real risk taking. Perhaps it was – I never had any bad experiences, but it was still legal to discriminate against us back then. Now I’m part of something that ‘outsiders’ generally have a vague awareness of and are ok about. No doubt there’s prejudice still out there (did I say Daily Wail at all?) but it’s small pockets, not widespread. The word ’pagan’ does not strike fear any more, not into the hearts of sane people, anyway. We aren’t fringe and secret any more. We’re increasingly open and visible. Even policemen can admit to being pagans. It attracts curiosity and the odd questions about naked dancing, and that’s about it. I wonder if there were people who were attracted to paganism precisely because it represented something outside the mainstream. For teen pagans that air of danger and rebellion was always going to appeal, but its fading. The more comfortable everyone else becomes with us, the easier being a pagan is. How much of the appeal lay in the challenge? How much of the sense of being special came from being socially unaccepted? And how true is that for other, less accepted and more radical faith positions? Religion. We want to belong somewhere. So many of us get a kick out of transgressing in some way, or having badges of specialness, difference, preference. We all want to be the chosen few, on some level. All of these reasons for seeking faith groups to belong to are very, very human. And at the same time, totally at odds with what all of those faiths are about. Belonging and asserting difference are all about our own individual selves. Spirituality, in all its forms is about reaching out to something bigger than us, external to us, however we conceptualise that. What’s wrong with being a witch? I don’t know what angered me more—that tea party candidate Christine O’Donnell trashed witchcraft or that people have a problem with a Wiccan running for political office. I wasn’t the only pagan upset about this. When I first saw the video with O’Donnell admitting to dabbling in witchcraft, I thought she was a nut ball and was glad she wouldn’t get elected since the majority of conservatives are Christian. But then I realized that by thinking that way, I was being as narrow-minded as everyone else that objects to any non-Christian religion. Why couldn’t someone with a brain admit to being a witch? Someone who could explain Wicca/pagan practices correctly? Pagans had a chance to have a voice and instead were aligned with Devil worshippers. So, what’s wrong with being a witch? Nothing, unless witches are truly as horrible as Christine O’Donnell described them. Thanks to her rambling nonsense, witches will have to work even harder to fix an already tarnished reputation among the mainstream population. Pagans do not worship the Devil, they don’t even believe in the Devil. The Devil is a Christian invention. I can see how people get confused, especially when the dictionary doesn’t even get it right. A witch practices Wicca. It would be awesome to have a Wiccan elected to a political office, but it was obvious from the way O’Donnell giggled and babbled in the video that she wasn’t serious about being a witch, and she didn’t know what she was talking about. And, Ms. O’Donnell, you don’t dabble in witchcraft. Witchcraft/paganism is a lifestyle. Let me interject here. This is a reaction I get often. Most women in this area of spirituality are not of color. Few are as young as me and gotten to this level of teaching and healing. Even fewer have a penchant for corsets and hot pink Converse sneakers. But I get it. I’m not what most people expect when they buy my book, come to classes or make an appointment for counseling and energy healing. Many people, regardless of religion or caste, hear the words ‘goddess’ or ‘spiritual’ and look forward to seeing me dressed in ritual robes or a dashiki, or for me to finish every sentence with “blessed be.” Some assume I’m a lesbian. Others see my skin color and are confused as to why I am not a Baptist, or surprised that I’m articulate. The stereotyping of spiritual people by other spiritual people is a regular occurrence, and to me it’s a bit odd. Aren’t we the ones who are supposed to be connected, the ones who see beyond socialization and conventionalism? But this pigeonholing happens, and most times people don’t even realize they are doing it. For some reason, we think: If you’re a Buddhist, you look and speak this way, a Christian walks and talks this way. Goddess women wear gauzy dresses and no bra. So while l I may not look like the typical Goddess woman, the typical counselor, the typical spiritualist, it’s who I am. If all the wondrous things I am make me an oddity – hooray! Who the hell wants to be normal, anyway? A complete and total dichotomy, the intersecting point between the expected norm and the unknown alternative, that’s me. Only now, I’m no longer afraid to admit it, I’ve stopped trying to dissect it, and I’m showing it without shame or explanation. There are counterculture spiritual folks out there waving the freaky flag with me (from the Dharma Punx to the Christian Goths), people from a different walk of life who find their pleasure and their joy from Spirit, those who may seem atypical to the generalized unpierced crowd but at their foundation are seekers of truth, love, and peace. Muslim Mosque and Religious Intolerance—Where Does it End? Building a Muslim mosque in New York close to the 9/11 ground zero site has raised some serious issues as well as anger. I can understand the anger some people have over this issue. My feelings are a little mixed and I wonder why anyone would even think that building a Muslim mosque in that area would go over well. That being said, I am also scared at the level of intolerance that this country is showing now. I will admit that I am no fan of the Muslim religion, but I feel that way about other religions as well. One can argue that the Koran says that Muslims should kill those who do not share their beliefs and so Muslims are dangerous, but the same can be said about the Bible and Christians. I am very familiar with the Bible, but admit I know very little about the Koran. The Bible is one of the most violent books I have ever read. What about all of the atrocities committed by Christians throughout history? Who can forget the crusades of the 11th, 12th and 13th centuries—the religious military campaigns in the Middle East—Christians killing Muslims in an attempt to take the holy land from them. And what about all the poor women and some men accused of witchcraft and killed during the European witch hunts from the 14th to the 18th centuries? What about Christians bombing abortion clinics? Do we abolish Christian churches because of a few radical Christians? Or what about all the reports of Catholic priests molesting children? Do we punish all of that faith because of what a few deviant priests did? Is it okay to kill in the name of religion as long as it’s the RIGHT religion? I don’t see anything different with the Muslims that flew planes into the World Trade Center and any other acts committed by radical religious nuts. The 9/11 Muslims don’t speak for all Muslims. So is it right to punish other Muslims for what those few did? Where does it end? I feel there is a certain faction in this country that wants America to be like Iran where only one religion is worshipped—and that would be the Christian faith. These people are truly un-American and seek to destroy the freedoms of being an American and the principals that this country was founded on. They can call President Obama a Nazi, a Socialist, a Muslim, or whatever, but he defended the religious freedom in America by saying that they have a right to build their Muslim mosque. The way I see it, today these people want to drive out Muslims, and tomorrow they will be burning pagans or anyone that doesn’t follow their religious agenda. This scares the hell out of me and I hope this country wakes up and realizes that things could get much worse.